August 18th is the commemoration of William Porcher DuBose in the Episcopal Church Calendar. As a graduate of the University of the South School of Theology, I have a particular affection for DuBose. I’ve particularly been enjoying his book The Gospel in the Gospels recently. Below is the collect, as well as the background piece from Holy Women, Holy Men, followed by a quotation from The Gospel in the Gospels. Almighty God, you gave to your servant William Porcher DuBose special gifts of grace to understand the Scriptures and to teach the truth that is in Christ Jesus: Grant that by this teaching we may know you, the one true God, and Jesus Christ whom you have sent; who lives and reigns with you and the Holy Spirit, one God, now and for ever. Amen. 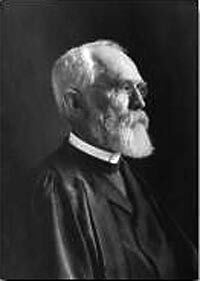 William Porcher DuBose, probably the most original and creative thinker the American Episcopal Church has ever produced, spent most of his life as a professor at the University of the South, in Sewanee, Tennessee. He was not widely traveled, and not widely known, until, at the age of 56, he published the first of several books on theology that made him respected, not only in his own country, but also in England and France. DuBose was born in 1836 in South Carolina, into a wealthy and cultured Huguenot family. At the University of Virginia, he acquired a fluent knowledge of Greek and other languages, which helped him lay the foundation for a profound understanding of the New Testament. His theological studies were begun at the Episcopal seminary in Camden, South Carolina. He was ordained in 1861, and became an officer and chaplain in the Confederate Army. Doctrine and life were always in close relationship for DuBose. In a series of books he probed the inner meaning of the Gospels, the Epistles of Paul, and the Epistle to the Hebrews. He treated life and doctrine as a dramatic dialogue, fusing the best of contemporary thought and criticism with his own strong inner faith. The result was both a personal and scriptural catholic theology. He reflected, as he acknowledged, the great religious movements of the nineteenth century: the tractarianism of Oxford; the liberalism of F.D. Maurice; the scholarship of the Germans; and the evangelical spirit that was so pervasive at the time. The one great lesson that must forerun and make ready the Christian unity of the future is this: that contraries do not necessarily contradict, nor need opposites always oppose. What we want is not to surrender or abolish our differences, but to unite and compose them. We need the truth of every variant opinion and the light from every opposite point of view. The least fragment is right in so far as it stands for a part of the truth. It is wrong only when, as so often, it elevates into a ground of division from the other fragments just that which in reality fits it to unite with and supplement them.